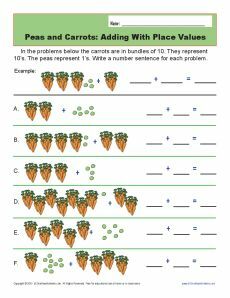 Your student will work on adding with this place value worksheet. The peas are ones, and the carrots are tens. It makes for tasty learning! It's great for Common Core Standards for Number & Operations in Base Ten for 1st grade. You may also use it for other students as appropriate.